A couple of weeks ago I had the pleasure of attending #TADTALK2016 organised by @Parthaskar and co.
My day began with a rude awakening; (not my alarm set for 6:15am) but diabetes took priority at 5:50am with a hypo - mmm how I love when that happens! I spent the morning stirring and made myself a coffee for the journey. Fast forward to 7:05am and @Oceantragic (Kev) and his daughter Amy are sat on my drive waiting to pick me up. Within a matter of minutes I felt completely at home with Kev and Amy, like I was part of their family. Three oyster cards, one wrong overground and five cookies later and we had arrived at Imperial College, London to sign in for the event. I quickly found friends that I’d spoken to via Twitter and we settled into the auditorium. Now there were 7 speakers in total, 6 of which had T1 diabetes- amazing. Now I’d be here all day if I were to go through all of them, so I’ve picked my top three. Each of these women I follow closely on Twitter so it was great to see them speak about their experiences in real life. The results are in no particular order.. There was one moment in particular that slapped everyone in the face. Lis spent a section of her talk on our complicated relationship with food. When we have a meal in front of us, all we see is numbers and begin to add them up. As you can imagine this puts a massive strain on our mental relationship with food and can cause problems - it’s something that I am struggling with at the moment. 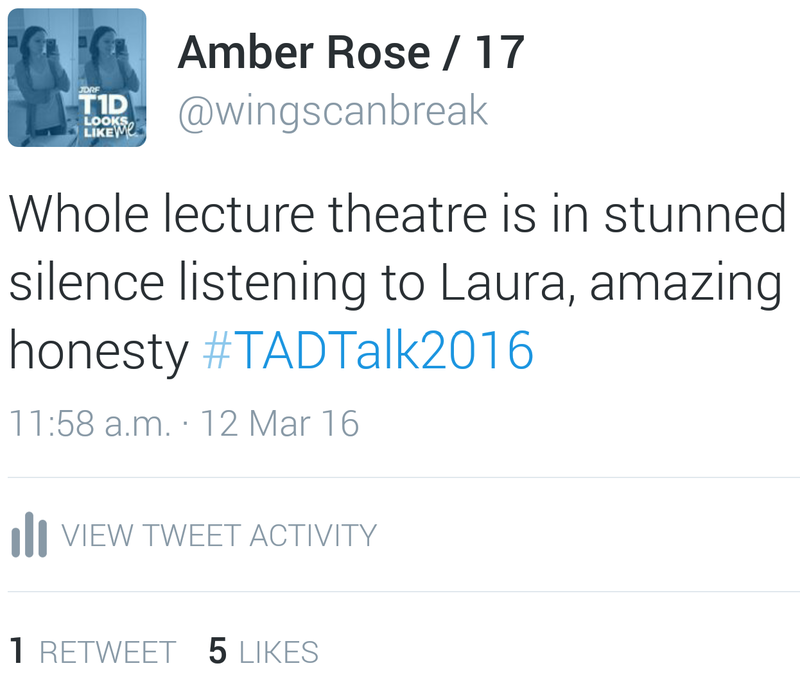 One statistic - ‘40% of people with diabetes have an eating disorder’ rang a few home truths in the auditorium. And if I could have stood up and performed a New Orleans type church praise then I would have done (with no regrets). Now Laura and I have spoken multiple times over Twitter and sparked an instant connection as we both live in Portsmouth (represent ;) ) so I was most excited to hear her story. She was diagnosed at the age of 16 in Disneyland Paris - of all places - and to my surprise spent years ignoring her diabetes. Laura gave a heartfelt account of her teenage years and touched on subjects like foot care and retinopathy. 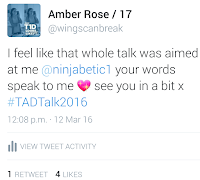 She shared her frustration at the lack of communication and language used by her HCPs as she was put straight into the adult team - her attitude to her diabetes was changed when Laura was approached by @Parthaskar, who convinced her that a social media outlet would be good for her, now widely known as Ninjabetic. Laura’s talk really spoke truth to me because she was explaining her experiences as a teen, and has commended me on my independent approach to my diabetes previously. She is an absolute inspiration as a diabetes advocate and does a wonderful job for our community. I certainly saw a bit of dust floating around in the theatre! So the northerner who was diagnosed as T1 in 1979 took to the stage and won us over with her charismatic charm and sense of humour. Anne talked us through the evolution of diabetes treatments over the years which was fascinating! Towards the end of her presentation she touched on current treatments like CGM (notoriously expensive) - I had to snap the slide as it was so funny. A roar of laughter could be heard all over London! The main theme to Anne’s talk was ‘resilience’ - ‘it means bouncing back from difficult experiences’ which can be every day with diabetes, she gave a great message. My highlight of Anne’s talk was her quote ‘sometimes it feels like two steps forwards, one step back..but you’re still moving’ - this hit home for me and keeps circling my mind when I’m having a bad day. 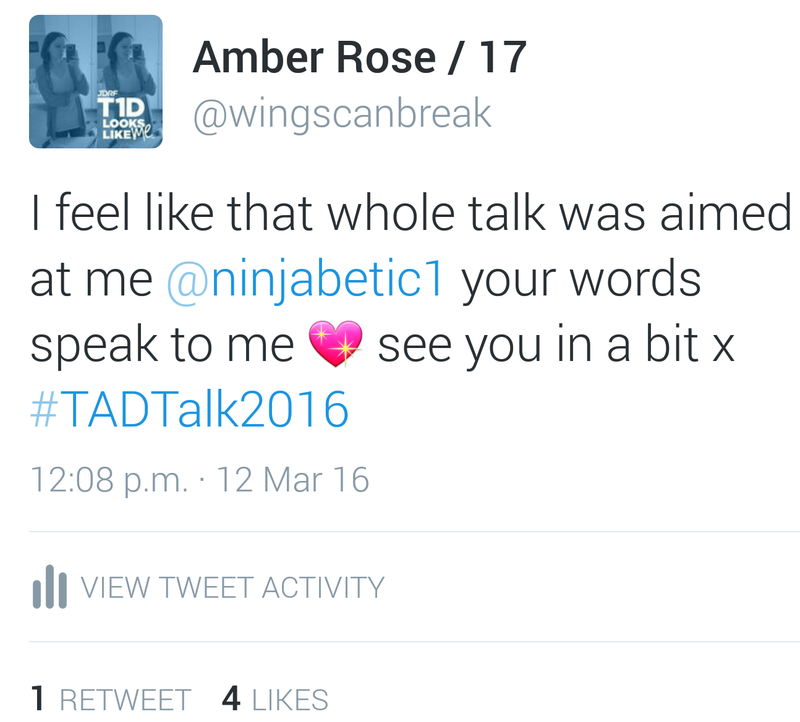 ‘These people are really cool, I quickly fell in love with the #DOC’ - about finding online peer support. So a huge thanks to @Parthaskar for making an idea into a reality. 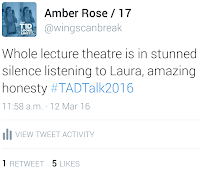 Heads up for #TADPOLES2017, which is for children and young adults - any space for a speaker? Great write up and great summary of the talks from three great people I'm proud to regard as friends. Diabetes Is An Invalid Excuse. All content is copyright to Diabetesgeek 2016. Simple theme. Theme images by gaffera. Powered by Blogger.